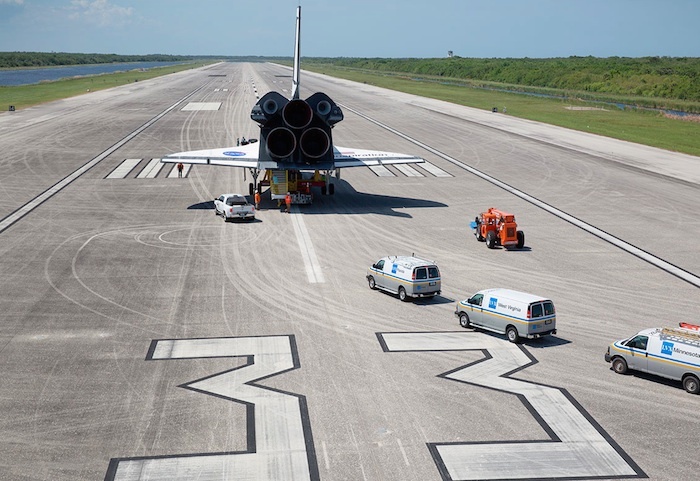 April 29, 2016 – Almost five years after NASA's last space shuttle landed in Florida, an orbiter returned to the runway at the Kennedy Space Center. 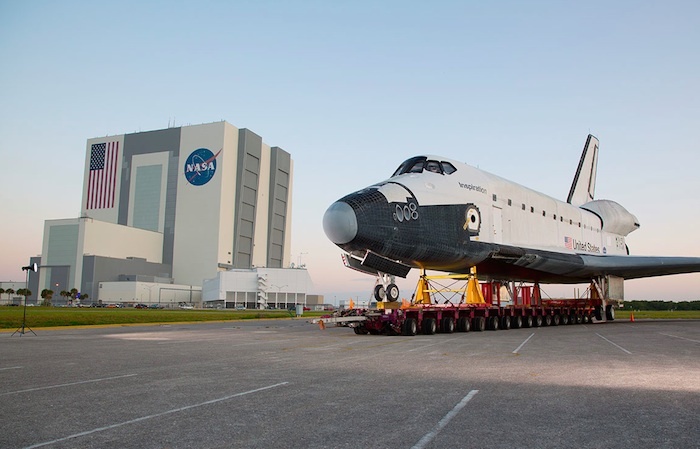 LVX System, which acquired the 122-foot-long (37 meter) shuttle replica from NASA, moved the Inspiration from the Hall to a work yard in January. The company, which has an agreement with NASA to study visual light communication for deep space missions, intends to use the space shuttle as a vehicle for both educational outreach and marketing. Over the past four months, work has been done to bolster the shuttle's structure and aesthetics in preparation for the move this week, an LVX spokesperson said. 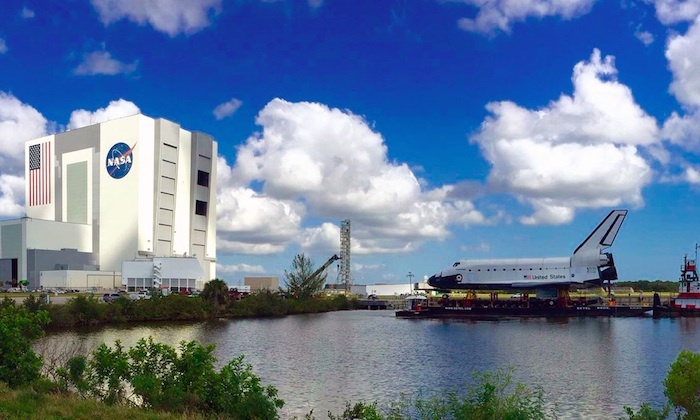 On Tuesday (April 26), the Inspiration was barged from the Beyel Brothers Crane and Rigging yard on Merritt Island to the turn basin opposite the 52-story-tall Vehicle Assembly Building at Kennedy Space Center. The space shuttle was then towed atop a multi-wheeled transporter to the Shuttle Landing Facility (SLF) the next day. Now parked on a concrete apron near the air traffic control tower at the midpoint of the runway, the Inspiration will be modified for its new "mission" — heading out on America's waterways. Although the details are still being determined, LVX plans to prepare Inspiration so that it can travel by barge along the nation's rivers, stopping at ports where the public might otherwise never see a space shuttle. To achieve this, the mock orbiter's wings may be reworked so they can fold for transport, among other proposed changes. LVX also plans to outfit Inspiration's crew cabin and flight deck such that simulated missions can be "flown" by those who visit the shuttle on its tour. The last real space shuttle to come to a "wheels stop" on the SLF was Atlantis on July 21, 2011. It is now on display at the Kennedy Space Visitor Complex. Orbiters Discovery and Endeavour each departed Florida for their own museum exhibits by way of the SLF, flying on top of NASA's Shuttle Carrier Aircraft. Since June 2015, the landing facility and its 15,000-foot-long (4,572 m) runway has been under the management of Space Florida, the agency that drives aerospace economic development in the state. In addition to be used as a work-space for the Inspiration, the SLF is expected to serve as a landing site for the U.S. Air Force's X-37B spaceplane and Sierra Nevada Corporation's Dream Chaser cargo shuttle.